This week, I will not have any new baseball posts, and will instead be focusing on what is either my third or second favorite professional sport (I can’t make up my mind; it would probably be second if you asked me on Saturday, but third on Super Bowl Sunday), thoroughbred racing. If you have any degree of respect for my baseball acumen at all, take that and divide it by 100 or so, and that is the degree of respect you should have for my opinions about horse racing. I make no claims to be an expert at all. This is a real good reason to ignore my Friday post in which I will attempt to handicap the Derby, but I think that I have good common sense arguments in this one. Every year, around the Triple Crown campaign, there will be stories about how long it’s been since there was a Triple Crown winner, and about how tough it is to win the Triple Crown, and invariably there will be musings on whether or not anyone will ever win the Triple Crown again. Sometimes, you will even see the word “impossible” thrown around. The early entrant into this genre in 2007 comes from Dave Schreiber in the St. Petersburg Times. In the interests of fairness, I should point out that at no time does Mr. Schreiber’s piece claim that it is impossible to win the Triple Crown. In fact, I think it’s a bad piece at all (although of course there are things I disagree with), I just want to use it as a starting point for discussion. I’m sure that somebody else, somewhere, will go ahead and throw out the impossible card at some point. Twenty-nine years and counting. Imagine if that much time elapsed before the NFL could determine its next Super Bowl champion or college basketball could crown another Final Four winner. But in thoroughbred racing, the ultimate achievement - the Triple Crown - remains a rarely witnessed pinnacle of greatness. This is the opening of the article, and it is simply silly. The Triple Crown is not the championship of American racing. The championship of American racing is the Eclipse Award for Horse of the Year, or you could make the case for the Breeder’s Cup Classic (since we are talking about the Triple Crown, I’ll take for granted that we are talking about the classic division and not the turf or sprint or other divisions that have their own championships and Breeder’s Cup races). There is still a champion horse and a champion three year old if the Triple Crown is unclaimed. A much better example, brought up in the next sentence by the author, is the Grand Slam in golf. No one has won that in forever, longer then the Triple Crown; that doesn’t mean that there was no champion golfer in all of those years. Does it mean so long to any realistic hope of seeing another Triple Crown winner? This follows an overview of how tough it is to win a Triple Crown, and that part is spot on--it's hard as all get out. But to jump from “It’s really hard” to “It will probably never happen” is never a good idea. It’s real hard to win 300 games, or win four gold medals in a single Olympics--but there’s a pretty high probability that those things will happen in your lifetime, particularly when no cap is put on it. "It's become the Holy Grail that nobody can quite get their hands on, but it will happen again, " says Cauthen the youngest jockey to win the Triple Crown at age 18. Steve Cauthen, jockey of the last winner Affirmed, is right on. Since 1979, 10 horses have won the Derby and the mile-and-three-sixteenths Preakness, only to fail in the punishing Belmont Stakes. This should be your first clue that there is a realistic hope. If ten times a horse has gotten to the point where they only needed one more win to do it, then there’s probably a pretty good chance that it CAN be done. Even if the horse would be a relative longshot, say 15-1 in true odds in the Belmont, you would expect it to happen every forty-five years or so at the rate we’ve been seeing horses win two races. What's more, in six of those attempts, the favorites finished second or third behind horses who skipped either the Derby or the Preakness or both - one of the many traditional hurdles that must be surmounted. This is a good point, and one of the many reasons why it may well be harder to win the Triple Crown in 2007 then it was in 1977 or 1937. I have no problem if that’s the argument that people want to make, that it’s harder now. I can accept that it’s hard; I can’t accept that it’s too hard to be done. From here, the article goes on to describe how you need luck, and about how there are so many bad things that can go wrong. Again, there is no debate on this point. You need luck to win the Derby and the Preakness. But given that that is accomplished, you only need enough luck to win one more race. There are a number of cases since 1978 in which a horse has just barely been defeated or has run into obvious bad luck, that any claim of being impossible is shattered, because it doesn’t take much good luck to change the outcome to wins. For instance, in 1979 Spectacular Bid supposedly stepped on a pin in his stall the night before the Belmont, causing him discomfort and taking him off of his game. What if Easy Goer’s connections had decided that continuing the rivalry with Sunday Silence in 1988 was a bad idea, waited to pick it up in the Travers or Breeder’s Cup, and not entered Easy Goer in the race? 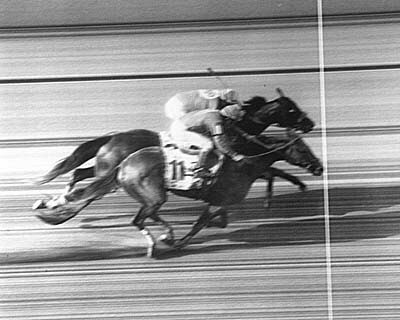 In 1998, Real Quiet was in a photo finish with Victory Gallop; the picture is at the bottom of the entry. That right there could be the beginning and end of the argument for it being possible; if you can come within a nose, you can win the Triple Crown. In 1999, Charismatic broke down in the final furlong of the Belmont. Even if one grants that the extreme stress of the Triple Crown campaign was the cause of the breakdown (since many other horses break down, on your low stakes local racetracks, it is hardly a given that that is the case), what if the injury had occurred just ten seconds later? In 2002, War Emblem stumbled out of the gate; granted, I don’t think there was a snowball’s chance in hell he was going to win anyway, but that’s another one. In 2004, Smarty Jones was beaten by a length by Birdstone. What if he had not been sent to the lead so early in the race? What if Birdstone had stepped on a pin in his stall, forcing him to be scratched? Who would have beaten Smarty Jones then? And of course, I have only dealt with those that one the first two legs. What if Point Given in 2001 had not run the worst race of his life in the Derby? He went on to pull a Triple Crown of his own, taking the Travers after the Preakness and the Belomnt, which very few have done. What if Afleet Alex could have found another three-quarters of a length in the 2005 Derby? What if Barbaro had not broken down, or if Bernardini had run in the Derby last year? Or what if Barbaro had broken down in the Derby rather then the Preakness, and Bernardini had been in the field? The point is, if there are this many reasonable scenarios where you change one detail and have a Triple Crown winner, then it cannot be impossible to have one. One could argue, I think, that recent years give encouraging reason to think a Triple Crown winner could come sooner rather then later. We just had a string of five straight years in which a horse had taken two of the classics snapped; that kind of streak had not occurred since 1939-1944. Too many horses have come too close to winning to believe that we are not likely to see it at some point. Just ask Real Quiet. I promised a piece on backtracking in scoring (this is one of the rare times that you, Mr. Reader, probably wish that somebody wouldn’t have kept a promise; just remember there is always a “back” button on your browser). And so here it is. The heart of the matter is that backtracking, in some form, is bound to pop up in any scoring system. The only question is in what form and to what extent. In the traditional approach to scoring, there are scoreboxes for each player’s plate appearances. In the box, you mark what he does in his PA, in addition to what he does as a baserunner should he happen to reach base. Taking an example from the Texas/Los Angeles game I scored last night(4/2), Kenny Lofton led off the game with a walk. While Frank Catalanotto was batting, he stole second. Catalanotto walked, then Lofton advanced to third on Michael Young’s double play ball, which retired Catalanotto. In order to record that event, you had to mark the double play in Young’s box, and the out in Catalanotto’s box, and the advancement to third in Lofton’s box. This necessity to mark in multiple boxes for one play is what backtracking generally refers to. The specific case in the Rangers game was not too bad because those guys were in consecutive lineup slots. It is possible that you would have to mark in as many as four scoreboxes for one play and go back as far as five slots back in the batting order. So the traditional method has what I call “recording” backtracking; in order to properly record the events, you must backtrack. It also necessarily has some “readback” backtracking, if you want to replay the game in sequential order. You can look in Young’s box and see that he hit into a double play, but you have to go back to Lofton’s box to see that he was able to advance to third on the play. However, it avoids another pitfall, which is what you could call “reconstructing”, relative to seeing the action a particular player was involved in. I can look at Lofton’s scoreboxes for the game and see all of the action that he was involved in; his walk, his steal, his advancement to third; I don’t need to go hunting through other boxes in order to see Lofton’s fate once he reached base. This is not the case for some other scoring systems. The Project Scoresheet system was originally invented by Craig Wright for his own uses, but was eventually adopted as the standard method for Project Scoresheet. PS differs from traditional scoring methods in that it breaks each scorebox into three lines. The top line is used to record events that occur during the plate appearance, like a steal or a wild pitch. The middle line is used to record the result of the plate appearance, such as a single or a flyout. The bottom line is used to record the advancement of the baserunners. The stated benefit of this system is that it does not require backtracking to previous boxes, at all. It doesn’t even require backtracking to previous lines within the particular scorebox. However, this property results in some very severe, and in my opinion intolerable, reconstruction problems. Before I air my grievances though, I should point out that Project Scoresheet’s goal was to collect data for all major league games, and to disseminate it efficiently. The straight sequential, no backtracking approach would work very well for inputting games into a computer. So judged by the standard of doing what Project Scoresheet needed to do, the system is fine. Judging it as a method of keeping score for the heck of it is where it fails. If the Lofton walks to leadoff the game, and you enter this into the computer, the computer remembers that. And so when Michael Young hits into the double play, and you mark “2-3” (the PS code for the runner at second advancing to third) on the bottom line of the scorebox, the computer understands that this runner at second was Lofton. But when you are a human, reading the scorecard back, you don’t implicitly know that, unless you remembered it, in which case you don’t really need to consult the scorecard at all. So instead you have to go looking back in the previous boxes to find out who that guy was. And this is not necessarily made easy for you. For the same reason, it is difficult to look at the scorecard after the game and see how many runs a given player has scored; you have to run through all of the action to see this. It is very hard to glance down at your scorecard during the game and figure out where the baserunners currently are, which to me is one of the basic reasons for keeping score--keeping tabs on the game, even if you don’t have access to the scoreboard of the “FoxBox” or what have you. For this very reason, after a play happens, and you have to record the baserunner advancement as a result of that play, it is difficult to figure out where they started from so that you can write in the codes like “1-3” or “2-H” or what have you. So while PS eliminates, almost perfectly, recording backtracking, it introduces a large amount of readback backtracking with respect to the identity of the baserunners, and it takes away a lot of the ability to quickly describe the situation at the moment that it occurs. I can easily accept that it is the fastest way to score, or the easiest to input into a computer, but as an everyday-use scoring method, it gets an F from me. The other alternative method for scorekeeping is Alex Reisner’s Situational system. His method involves marking the baserunners’ location at the outset of every plate appearance. Any advancement during the PA (stuff that would go on the first line in PS) is marked on the diamond in the scorebox. There is a line on the bottom of the scorebox for recording the outcome of the PA, similar to the middle line in the PS system. The advancements made by the baserunner as a result of the PA are not marked, except to circle or underline the number of the batter if he scores. You can see where they ended up by looking at the next scorebox, which will mark their new position. This, similar to PS, eliminates recording backtracking, with the exception of how putting dots in the center of the diamond of runners who scored or similarly indicating the out number in the box of the player who was retired. It does have some of the reconstruction problems of PS, as you can’t just look at Lofton’s boxes to see what he did; however, Reisner makes it a lot easier for you, because you can look for Lofton’s number in the other boxes, unlike PS where you would have to pick through the boxes, making sure to remember what base he is on at any given moment. One annoyance of the system for me is that you have to record the uniform number; I always use lineup slot, but that doesn’t set apart substitutes from starters easily. I also don’t like having to mark down the location of the baserunners every single PA. For me, the traditional method is still better then situational, but I can see why some are fans of the situational method. I don’t understand the appeal of the Project Scoresheet system unless you have a microprocessor for a brain. With another season underway, it’s time to resume my favorite baseball-related activity: scorekeeping. I have written about scoring before here, but it is one of my favorite non-technical baseball subjects (although it is still in the pocket protector area of interests, I guess), and so I may revisit it occasionally. Scorekeeping is an intensely personal art--everybody has their own style, their own system, their own scoresheet, and oftentimes what one person finds normal and preferable is seen by another as bizarre and unwieldy. I could go on and on about critiquing others’ scoring methods, and I may some time, but it always must be with the caveat that those critiques would be solely opinion. There is no right or wrong way to keep score, as long as you accurately record the events of the game. Anyway, since scorekeeping is a personal thing, I suppose I should give some personal background on it. I was always a nerdy kid--heck, when I was six or seven I made index cards with facts about the planets and their moons (stuff like distance from the sun, mass, etc.). I probably didn’t understand half of it but it gives you the idea that when baseball caught my fancy, it was a natural progression to become involved in statistics and scorekeeping. My dad taught me how to score so that I could do his team’s softball games when I was nine. Shortly after that I started scoring big league games--I remember scoring one of the games of the World Series in 1995, maybe Game Six, only to see my Indians lose the game. I erased all of the markings on the scoresheet (I never score in anything but pencil), but history shows that the result of the game still stands nonetheless. At that time I was using blanks from the softball scorebook, which were fairly standard sporting goods fare with diamonds in blue ink. However, in spring training of 1996, not wanting to use up all of the pages of the scorebook, and not having immediate access to a copier, I began keeping score on looseleaf pages of notebook paper, which I kept in a three-ring binder, drawing a diamond each time a batter came up and writing the name of the pitcher and hitter for every plate appearance. It was also around this time that I got a baseball book for kids out of the library which had a section on how to keep score; I have no idea what the name of the book was, but I did adopt at least some of the system. The main thing, that I still use to this day, was the use of a horizontal line for a single (-, although a little longer), two for a double (=), three for a triple, and four for a homer. For my birthday that year I got a couple of brand new scorebooks. I used one of them to score four Indians games in April and May, but I apparently stopped and went back to the copies for reasons I don’t recall. It wasn’t until 1997 that I began scoring in earnest again, this time with a green ink diamond scorebook (“What’s the Score” brand), a book that I still use when I am willing to put up with the diamond and wanting to take a book to a ballgame instead of a loose sheet on a clipboard. “What’s the Score” is better then many of the other sporting goods fare scorebooks because they don’t have too much crap cluttering the scoreboxes. I absolutely cannot stand the multiple choice options for reaching base (S, D, T, HR, W printed down the side of the box), or scoreboxes with the fielding position numbers (1, 2, 3, …, 9) superimposed over the diamond as if I’m too stupid to remember them from play to play. Anyway, I scored 24 games in that book, plus some others on a sheet I made myself in a text editor on the computer (it was DOS Brief I do believe). That was an ill-fated attempt at applying some of the Project Scoresheet ideas, namely not having a scorebox for every batter in every inning and being able to quickly account for substitutes through use of the numbered boxes. Luckily I did not fall into using the PS system, despite the fact that at the time I was reading a lot of Bill James and he was an advocate of that system. The PS claims to eliminate much “backtracking”, and in some ways it does, but it introduces even bigger problems IMO. More on that some other time. Over the winter of 1998 I worked out a new design in Brief, which with more then a few modifications I still use as my primary scorecard. I often come up with new designs, that I make into fruition with Excel or Photoshop, but I’ve never re-invented the scorecard wheel, or even tried to. Most of my new ideas are just different incarnations of the same old same old. Anyway, that’s my personal scorekeeping background, as if you cared. The Indians/Mariners four-game series has been completely wiped out due to snow in Cleveland. The obvious question is why are games being played in cold-weather cities early in April? Obviously, bad weather can come at any time, but it is far more likely early in the year. Apparently, MLB tried scheduling in warm weather cities and domes a while back, and there were many complaints from northern teams because they had to play the first week or so on the road. The southern teams probably weren’t too pleased either, as their early season attendance is probably not as good as their later season attendance, and so by playing at home early in April, they would necessarily lose games later on. So experience shows that no one is happy with an all-south and dome early season schedule, so that’s out the window. Fine. But what is particularly galling about the Indians/Mariners situation is that it is the only scheduled meeting between the two teams in Cleveland this year. That makes makeup games a total pain in the rear. If you insist on having early season games somewhat evenly distributed between cities geographically and by climate, then the least you can do is to make those intra-divisional games. Since you are already playing those teams a billion times thanks to the ridiculous unbalanced schedule anyway, it makes it a lot easier to schedule makeups. But why you would have the only series of the season in Cleveland between the Indians and an inter-division opponent with a dome in the first week of the season, followed by a trip to Cleveland by a team from the best weather location in all of baseball (southern California--after all, as the song says “It never rains in Southern California”), is beyond all logic and reason. UPDATE: This doesn't fit the subject, but it does fit the title. I am watching the Yankees/Twins on ESPN right now, and Rick Sutcliffe said something to the effect of "It's scary to think how good the Twins could be had the economics of the game allowed them to keep David Ortiz as their designated hitter." Uh, Rick, Ortiz was RELEASED by the Twins after making $950,000 and was paid $1.25 million in his first year with the Red Sox. Apparently, he was released to make room for Jose Morban on the roster. Yeah, Rick, real economic distress there. The Buckeyes are in Illinois this weekend for their first road B10 series after taking 3 of 4 from Iowa last weekend. The series was an offense fest, with the Bucks winning by scores of 12-7, 6-2 (in 7), and 16-7, while losing 8-0 in 7. That puts the Bucks in a tie for second place, with only the forces of evil sweeping their series over the weekend. Unfortunately, the midweek game on Wednesday had to be cancelled because of snow, rain, high wind, temperatures in the thirties, and other things that make beisbol miserable. The weather doesn't look too much better in Illinois, but hopefully they'll get the games in. OSU has had some pitching problems; ace Dan DeLucia is still out with a tender elbow, and #2 reliever Rory Meister was out last weekend. DeLucia will not return this week, but I am not certain of Meister's status. The bullpen was not in the best shape before the problems, but that was exaserbated by the lack of availability of those two. Cory Luebke slides up to Friday starter, with Josh Barerra staying on Saturday duty and JB Shuck on Sunday. However, Theron Minium is forced into the second Saturday start, and that forces Eric Best and Josh Edgin to shoulder more of the relief load then Coach Todd would be comfortable with. Even with these problems, though, the Buckeyes have the ability to win the B10, and the bats have really come alive, even hitting four homers over the weekend (albeit three on Sunday, surely at least a little wind-aided). Jeff Brantley was one of the worst ESPN commentators; now he’s apparently moved on to Fox Sports Ohio and the Reds radio network, which is just lovely, because now I have to hear him more often. Those of you not in the lower 2/3 of Ohio, Kentucky, southern Indiana, etc. are probably rejoicing with this news. My first exposure to Brantley as a Reds announcer was for a game against the Blue Jays late in spring training. It was on the radio, and he was just as bad of a analyst as usual. What was terrible, though, was the exaggerated southern drawl he was speaking. I never heard anything remotely close to it when he was ESPN; I guess he decided that he needed to appeal to the Kentucky portion of his audience, and with a bullet. Or is that a mullet? Anyway, last night, the Reds brought in their rookie reliever Jared Burton in the ninth innings. He proceeded to quickly walk the first three batters of his career, although fortunately for Cincinnati the first was caught stealing. Brantley then launched into a story about how he was so nervous in his major league debut that he couldn’t even swallow. He claimed that he was pitching for San Francisco against the Braves in Atlanta, and that he walked the bases loaded and then wriggled out of it. This immediately set off my BS detector, and so I went to Baseball-Reference, which through the wonders of Retrosheet, has quick access to info on Brantley or anyone else’s big league debut. Jeff Brantley’s major league debut was on August 5, 1988. He was indeed pitching for San Francisco, in Atlanta. Retrosheet is a wonderful organization that has provided a treasure trove of data, but thankfully there is a limit to how much detail they have, and we cannot confirm that Brantley’s mouth was dry and he was unable to swallow. What we can confirm is that he did not walk the bases loaded; in fact, he didn’t walk anybody, and he didn’t seem to have much trouble throwing strikes. Brantley came on in the bottom of the 5th with the Giants down 8-2. He pitched 2 innings, allowing one hit, and nothing else across his line. He threw 25 pitches, and 15 of them were strikes. What would his motivation be for telling a fib like that? The easiest answer is that he wanted to be a little bit of a homer and make an excuse for Burton. Another possibility is that he just doesn’t remember, which given what I have heard about what a rush it is to make your debut I have a hard time believing. But either way, Jeff, next time, look it up. What is Greatness, or What is Peak? The only reason I bring this up is that “great” and its synonyms are often used in Hall of Fame discussions, or the ever-present “100 Greatest Players of All-Time”. Even though it is difficult to define greatness, everyone has some internal definition that guides their thoughts when answering these questions. So suppose you have your personal definition of greatness, and it involves “peak value” or some such thing. How would you go about convincing me that I should care about peak value as it relates to who should be in the HOF or whether Sandy Koufax was “greater” then Don Sutton? Truth be told, I have never seen a satisfying explanation. I suppose this could be because I am not in that camp, and my definition of terms is different then yours, and this different viewpoint is an insurmountable obstacle in me accepting your argument. This may well be true; however, I will now try to justify my position, which is that the concept of peak value is unimportant for anything other then the question of who had the highest peak value. In other words, I don’t think that looking at a player’s five best seasons or best three consecutive seasons or eight best seasons or what have you is very useful in answering the HOF or greatness questions. There is nothing wrong with asking “Who was the most valuable player over a five-year period?”, but I simply do not see the relevance of this to the greater questions. My position starts with the premise that what is truly important in the baseball world is helping your team win games. We could now digress and argue about whether this means the actual wins you contributed, including the situation in which your performance occurred (WPA); or whether this means the actual wins you would have contributed had your performance been distributed across possible situations in an average distribution (TPR); or whether this means the actual wins you would have contributed if you had played in ballparks that were neutral in every way, and again your performance had been distributed across possible situations in an average distribution (XW); or any other number of possible ways you could quantify “value”, “performance”, or “ability”. But I’m not going there, not now, because one can agree with the principle that contributing to team wins is the important thing without agreeing exactly on how to quantify the contribution. From my perspective (and again that’s all I can offer here, and I’m not passing this off as a black and white issue), the only way I can see giving extra credit for peak performance is if it results in tangible team success, more so then scattered performance would. This standard immediately in my mind throws out any construction of “best 3 years” or “best 5 consecutive years”. There’s no logical reason why some arbitrary standard like that would be directly related to the extra team success resulting from clustered performance. It *may* be correlated with it, but it certainly in and of itself does not represent it. Therefore, it all comes down to the extra team success. What value is it to a team to have ten wins in one year rather then five wins in two different seasons? There are two possible answers that I can see. One is that since the number of roster slots on a team is constrained, a player who contributes +1 WAR may have positive value, but if you have a whole team of guys like that, you’re only going to win 82 games. In other words, there is a “roster slot filling cost” that delinearizes the relationship between two players’ WAR. This I can accept, but I don’t think it would make a big difference. The other, and much more common and potentially bigger impact answer, is that concentrated performance helps the team to win more pennants. Bill James and others, particularly Michael Wolverton and Dan Levitt, have modeled this and found that it is true. One 10 WAR season will have a bigger “pennants added” value then two 5 WAR seasons. However, the difference is not great. Under a career “pennants added” approach, Sandy Koufax is still unable to crack a list of the forty most valuable pitchers of all-time. Also, these approaches are fairly hard to do properly, as you need to make a number of assumptions about the distribution of team winning percentage, what exactly the “pennant” threshold is, how the player’s impact on the team should be valued, etc. Of course, one could argue that this means that the existing approaches are inadequate and that this is why the results have not saved Koufax. I do not think this is the case, I am only weakly trying to justify why I have not gone all out in trying to model it myself. The most user-friendly approach I believe would be to compare the rigorous Pennant Added figures to more conventional ones, and either find a baseline that approximates the impact, or maybe a formula that uses an exponent to increase the value of big seasons, etc. From my perspective, “peak” is a fuzzy word, since so many people have their own definition for it. Now “peak” is fine for answering the question of “who was the best over a five-year span”, which, while I don’t feel is particularly relevant to the HOF, I have conceded is a legitimate question to ask, if only for the heck of it. I think that “clustered” or “concentrated” performance is a better way to describe the potential impact of high “peak” performance as it pertains to a discussion of the player’s career as a whole. But what nobody has ever been able to explain, at least persuasively enough to change my outlook, is why I should, say, evaluate Hall of Famers based on “peak” value. It seems to come down to a belief that the Hall of Fame is about “greatness”, and that Sandy Koufax was great and maybe Don Sutton was and maybe he wasn’t. Koufax just should be in the Hall of Fame because that’s how they feel. Well, if that’s how you feel then knock yourself out. But it ain’t me, babe. I hereby issue a friendly challenge for any peak supporter who happens to be reading this to write a comment explaining why I or anyone else out there should evaluate Hall of Fame candidates in terms of peak value rather then in terms of career value, with considerations for the extra value of “concentrated” performance. I just explained why I don't buy into the peak value mindset, so I would love to know why I'm all wet, if you feel that way. And I certainly wouldn't mind giving your view exposure. If you want to write an article lenght response, I'll even post it here, assuming you have no better place to post, which is doubtful because in five minutes you could set up your own blog which would probably beat posting here. With the major league season getting underway today, it’s time for my annual exercise in public humiliation, otherwise known as predictions. I think that everyone sits around and tries to figure out who is going to finish where in the divisional races, but only a small percentage of us are dumb enough to post it on the internet for posterity’s sake. I will repeat my usual caveat, because it bears repeating. One would think that everyone has an understanding of this, but sometimes when I read prognostications in mainstream outlets I wonder. If I pick, say, the Braves to win the NL East, that doesn’t mean that I think that the Braves are a lock to win the NL East. It doesn’t mean that I think the Braves are more likely then not win the NL East. All it means is that I feel that the Braves have the best chance of the five teams to win the division. But if, continuing to make up numbers, I feel the Braves have a 40% chance to win the division, the Mets 30%, the Phillies 20%, the Marlins 6%, and the Nationals 4%, then I am really saying that I don’t the Braves will win. I think that 60% of the time, the Braves will fail to win. I think that the Red Sox are well-positioned to finally break the Yankees run at the top. Matsuzaka looks like the real deal, Beckett should bounce back, and adding JD Drew and Julio Lugo will help the offense put enough runs on the board. New York’s pitching is a little too shaky for my liking, and while their offense will still be excellent, they are not getting any younger and they’re not going to get much production out of first base. Toronto would be a serious threat in any of the other divisions, and could make it interesting here. Baltimore added some shiny relievers; that usually works out great. Tampa Bay could finish fourth, and they could build a contender in the next couple years. The Indians are my team, so one could accuse me of seeing things rosily, but I really think that this is a three-team war. The Tribe, Twins, and Tigers are all fairly evenly matched, and it is possible that 88 wins could take it. It is also possible that as Chicago did in ’05 and Detroit a year ago that one of them could assert themselves and run away with it, at least for a while. However, I don’t think that Chicago can be that team. I can see them finishing ahead of one or perhaps even two of the favorites, but not all three. I think under .500 is more likely for the ChiSox then the postseason is. Kansas City will have some promising players; Gil Meche isn’t one of them though. I keep going back and forth on the Angels and the Rangers. The Angels look better on paper, but Texas could get bouncebacks from Wilkerson and Blalock, and they could have a bullpen to match LA’s with some health for Gagne. There is also the tough, demanding manager replaced by a more laid-back type dynamic in play (Showalter and Washington). Oakland did it with mirrors to some extent last year; now with no Big Hurt, it’s going to be tough to get the offense, although a healthy Bobby Crosby would be nice. Seattle will be the first to get a new manager, and Bavasi will continue to wander in the wilderness without a plan. I have been picking the Phillies to do SOMETHING for at least four years now, and I’m not stopping now. They have, I think, the best rotation in the NL, and their offense is pretty strong too. The Mets’ rotation is a disaster area, but they almost made it to the World Series with a similar situation last October. Atlanta will be in the mix too; their bullpen is vastly improved, their offense is strong, and their rotation could surprise. I can’t picture Florida’s youngsters taking another step forward, and it would take that in order to truly contend this year. Washington is the worst team in baseball, and they make the Mets rotation look like the ’54 Indians. I cannot make up my mind with this; I could see any of the top four winning, and this could be just as ugly as it was a year ago. I hate picking a bandaged together team of free agent signings like the Cubs to win, although I had similar misgivings about the Mets a year ago. However, the Mets were definitely the rich man’s variant of the archetype. Houston’s pitching will be worse, especially without Rocket reentry, but I expect Brad Lidge to bounce back. It’s hard to pick a team who is going to put Braden Looper in the rotation to win anything, even if they are the defending World Champs, but I wouldn’t be shocked to see them patch things together. Milwaukee had some disappointing seasons last year; with health and good fortune, they could be the surprise of the season. The Reds are a lot further away then they seem to think they are, but at least they have Bill Bray and Gary Majewski to save them. The Pirates are the same as they’ve been for the last decade. This one was probably the best race last year and it should be fun again. The Padres and the Dodgers will both take another shot, and I consider then basically equals on paper. I like the Padres trade for Kevin Kouzmanoff coupled with bringing in Marcus Giles to fill the second base hole that it created. They have an excellent staff too, but so do the Dodgers with Schmidt brought in, plus the youngsters like Billingsley and Broxton are pretty interesting. But don’t count the new-look Diamondbacks out. If their youngsters play as they are capable of, they could win this thing. But I am more comfortable picking a veteran team where the variability of performance is presumably smaller. The Rockies are making forward progress at least, although it remains to be seen if the humidor is really a magical somewhat normal condition creator. San Fran is a good bet to be the worst team in baseball in two years, if not sooner. I doubt he’ll actually win, as the anti-Japanese ROY tendency seems to be getting stronger, but that doesn’t mean he won’t deserve it. I would not be surprised to see King Felix go all Doc Gooden on us. I think he’ll actually regress from last year, but when the Indians win the division, he becomes this year’s Morneau. This is one of the “youngsters” I was referring to in their comment. This obviously makes the shaky assumption of good health. Since he didn’t win it last year, he’s fair game to pick again this year. Call this the Morgan/Garner award. Wedge and Manuel will each be on a short leash, but their teams could overcome a slow start that costs the skipper his job and still play in October.